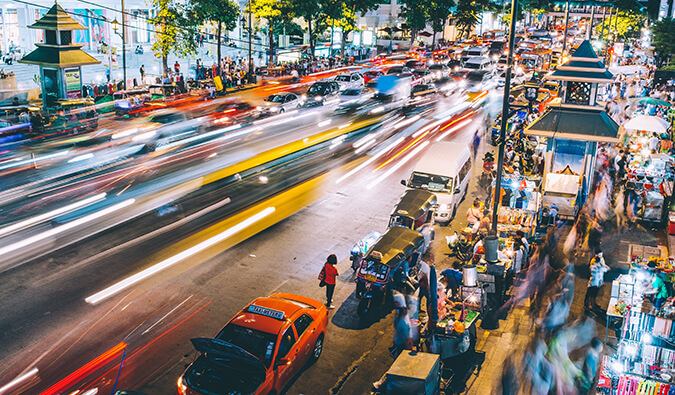 Bangkok is known around the world for its chaotic, crowded streets, cheap prices, wild nightlife, and never ending traffic. Most travelers either love or hate it. I used to hate it because of its pollution, noise, and crowds, but when I got to know it more, I changed my mind. The city is like an onion. It slowly reveals its secrets to those who spend a little extra time here. You’ll find that this seemingly ugly city has a lot of beauty. There’s not a lot for travelers “to do” here, but when you stay a little while, you see this isn’t a city of activities – it’s one of friends, food, drinks, and life. There’s a flow to it. I lived here in 2006, fell madly in love, and I’ve visited every year since! 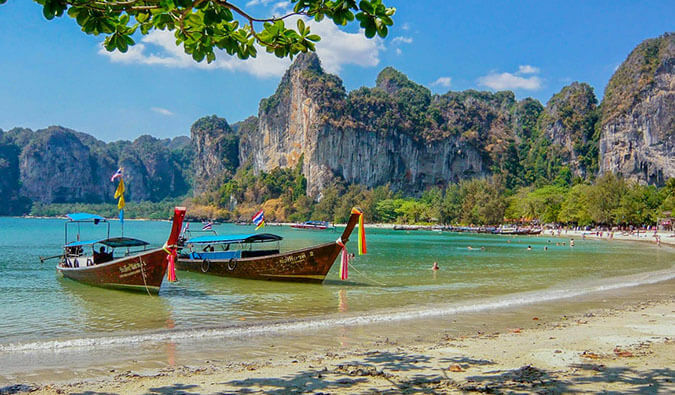 Let this travel guide show you there’s more to Thailand’s “City of Angels” than you think! The palace is the official residence of the current monarch (though it is just used for offical ceremonies). Check out Wat Pra Kaeo, which houses the 15th century Emerald Buddha, tons of temples, statutues, and beatiful reliefs. Afterwards, head to Wat Po to see the famous golden reclining Buddha statue. It costs 500 THB to enter the Grand Palace and 100 THB to enter Wat Po. The weekend market is an ideal place to buy anything and everything. This football-stadium-sized marketplace offers the best place to get gifts, find knock-offs, barter, or have some good food. Definitely come here on a Saturday or Sunday to shop around! 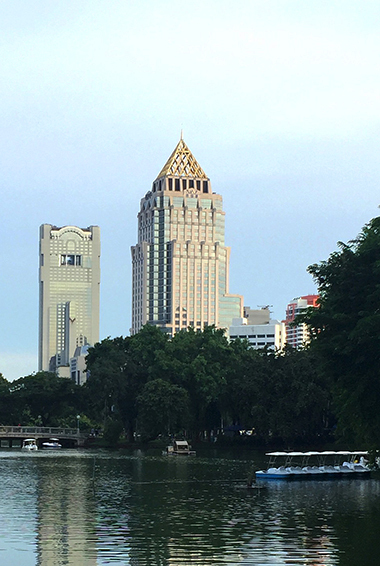 Outdoor enthusiasts will find it hard to tear themselves away from Bangkok’s Lumpini Park. Jogging paths, bicycle roads, picnic, and chess tables, Tai Chi classes, plenty of trees, weight-lifting, and rowboats for rent on its pair of lakes offer plenty to do and all the time in the world to do it. Jim Thompson was a former American spy and silk merchant in Thailand during the 1950s and 1960s. He built his traditionally Thai home in Bangkok and decorated it with beautiful teak wood. 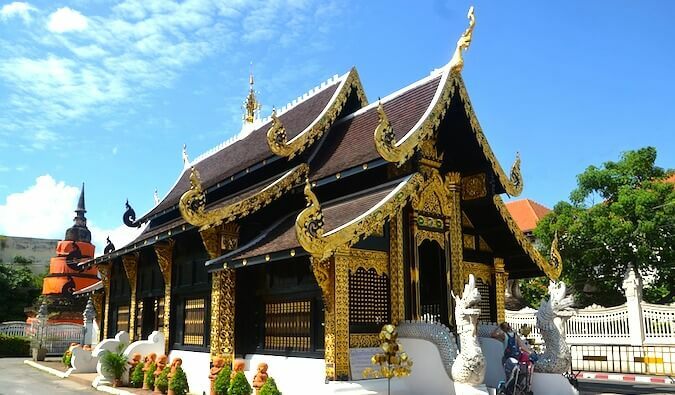 He vanished mysteriously in 1967 but now his house is now a monument to traditional Thai architecture. Proceeds from the entrance fee go to help orphaned children. This is a gorgeous Buddhist temple on the Chao Phraya River opposite the Grand Palace. 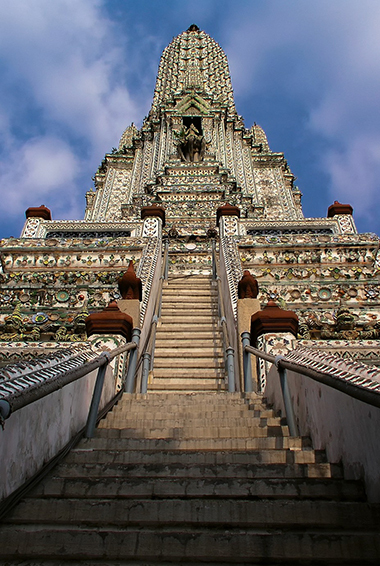 It has one main spire and four small ones and is so iconic you’ll find it on Thai money. From the top of the main spire, you get to see stunning sweeping views of the city. The stairs are steep, so be careful. It’s open every day and only costs 50 THB to enter. Elephants have long played a significant role in the lives of the Thai people. The museum is located within the parliament compound and is a visual testament to the value of the largest land animal and to the beliefs surrounding its participation in religious ceremonies. The museum is open to the public every day from 9:30am to 4pm and is free with a ticket to the Grand Palace (or 100 THB when purchased separately). The floating market is just outside of Bangkok, and while mostly for tourists, I like visiting. The tours that come here are about half a day and leave early in the morning. It’s not a great place to shop but the area is good for photography and eating, two things I love a lot. 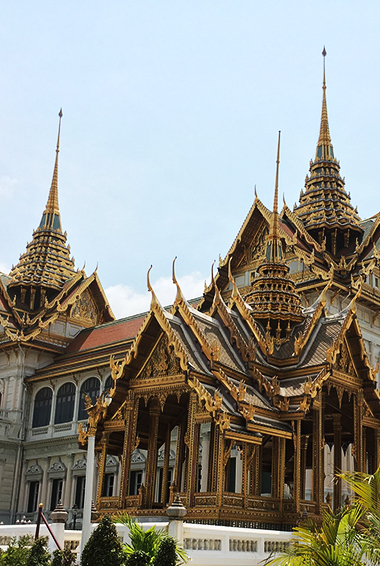 Bangkok is full of history, temples, and Thai ruins. There are about 10 main temples in the city, and you can easily just hire a guy to take you to all of them in one day. They all have different architectural structures and layouts. It will take about five hours to see them all. If you don’t have that much time, aside from the Grand Palace and Wat Po, make sure you check out Wat Arun, The Temple of the Dawn. Bangkok has so many malls that in the center alone, I can count 12 in a four-block radius. Bangkok has everything you could ever need and at great prices. Make sure you check out Siam Paragon (for designer clothes), Terminal 21 (to see the stunning internationally-themed decor), Platinum (for cheap, trendy clothes), Pantip (for cheap electronics), and MBK (for cheap knockoffs). Khao San Road is the infamous backpacker/tourist street in Bangkok. All travel roads lead in and out of here. However, it is more than just a transit hub for travelers. Here, you can find nightlife, great food, great shopping stalls, tons of people watching, and activity all day and all night. Here’s a video. Only about 1km away from Khao San Road, The Temple of the Golden Mount features an enormous chedi (a mound-like structure containing Buddhist relics). This is one of my favorite temples in the city because of its exquisite golden temple, stunning setting, and wonderful views of the city from the top. Entry is free. Close to Bangkok, you’ll find the old capital, which is home to the summer palace, tons of breathtakingly unique temples. In 1991, it became a UNESCO World Heritage Site. 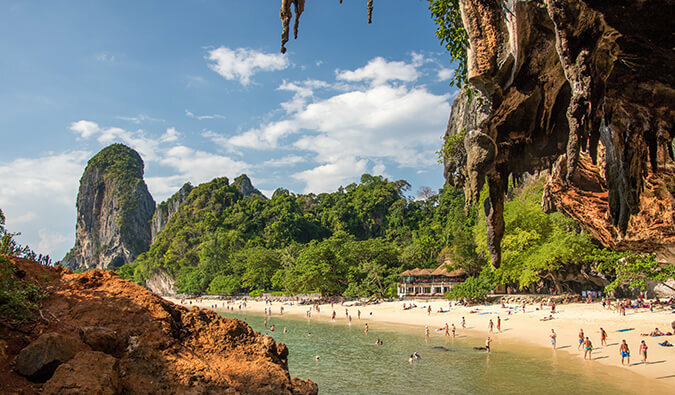 Since it is so close to Bangkok, it’s a very popular day trip destination for tours. 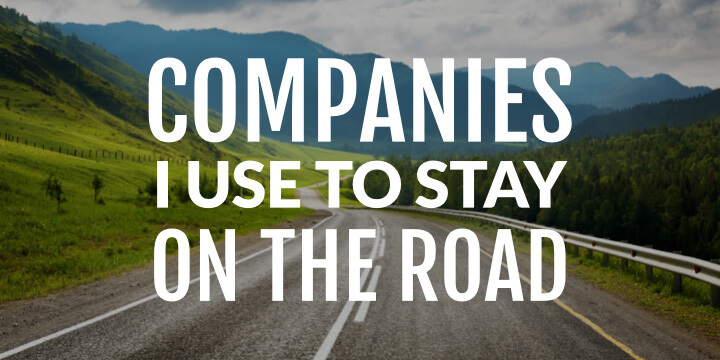 Lots of companies offer trips but it’s so easy to get to, I would simply go on your own by train. This theater which lies on the river was founded by a Thai actress. It is a trendy place that offers a variety of performances: acrobatics, drumming shows, theater, and dance. There are lots of drinking areas with countless street bars (Khao San Road and Silom are the most popular nightlife spots in the city). You’ll never have a problem finding good bars and clubs to go to. Some of my favorite bars are Brick Bar, Smalls, and Whisgars. First, wander among the lilies, birds of paradise, and orchids at Pak Klong Talad, the flower market at the north end of Chinatown. From there, grab a bite to eat at one of the main enticing food stalls. A huge aspect of Thai drama revolves around puppetry. Two types are common – Nang (shadow puppets) and Hun (marionettes). If you’re lucky, you can see a show at an outdoor festival; otherwise, head to the Thai Puppet Theatre. In this trend-conscious neighborhood, you’ll find the city’s top-end dining and nightlife, including many Western jazz bars and beer gardens. It’s very popular with Bangkok’s young middle and upper classes (the see-and-be-seen crowd).end a trendy night out. Known as the “Venice of the East”, Bangkok used to be full of waterways and canals. While not as many of those exist as there used to, you can still see many of the old bridges and stilt houses crowding the waterways. You can still cruise along the Chao Phraya River to see some of what remains, usually for only about 100 THB. The Klhongs of Thonburi offers picturesque views of the old wooden houses and colorful pots of flowers. 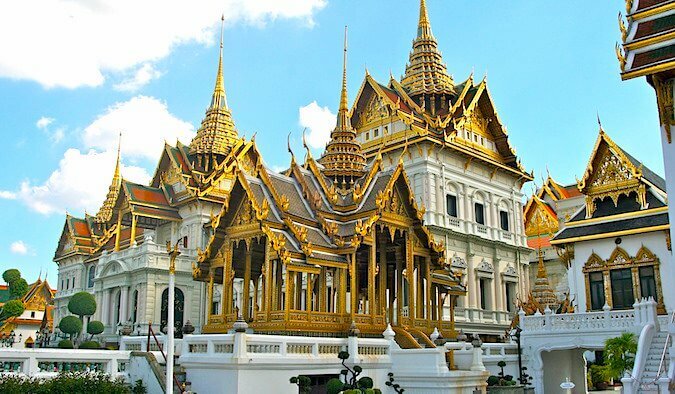 Built in the year 1900 by HM King Rama V, this royal palace is also the largest teakwood mansion in the world. 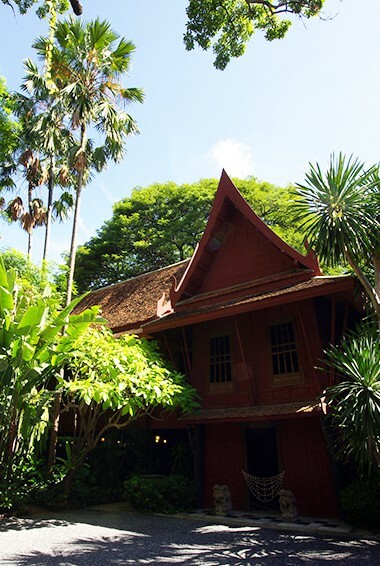 It now houses the Thai National Heritage museum, and also boasts beautiful gardens and canals to explore on the estate. It is now full of collections of antiques, old photographs, porcelain, and memorabilia from the King’s reign. Admission is 100 THB. Rot Fai Market (or Train Market) is an authentic open-air bazaar selling an array of vintage collectibles and memorabilia, from antique furniture to hippy fashion and Mao kitsch. The Train Night Market is absolutely one of the coolest markets in Bangkok. Open at night on Thursday through Sunday. Thailand’s first zoo, built over 60 years ago, sits in the middle of Bangkok’s administrative center and is surrounded by important buildings like the Throne Hall, Parliament, and the Chitralada Palace. It is a fully functional park, with an animal hospital, education center, and museum. There is also a sightseeing train that takes you around the zoo to see the more than 1,600 animals there. Keep an eye out for the albino barking deer and the white Bengal tigers. Admission is 100 THB. Budget hotel prices – Budget hotels start around the 400-500 THB range per night and include hot water and private bathrooms. Quality varies greatly so be sure to look at the reviews online. Most hotels offer free WiFi and air-conditioning and many offer free breakfast as well. As for Airbnb, you can find full apartments for rent at an average of 1,250 THB. Although not a budget option, Aloft Hotel is one of my favorite hotels to redeem Starwood points for. Note: In this city, I recommend getting a private room in a hostel or a guesthouse over a cheap budget hotel room. Average cost of food – In Bangkok, you can eat from the street vendors for as little as 30 THB per meal (i.e., soup, pad thai, fried rice, som tam, etc), purchase a bag of freshly cut fruit or Thai ice tea for 20 THB, or get a grilled chicken, rice, and som tam meal for 150 THB. Sit down restaurants begin at 50 THB per meal while Western food begins at around 100 THB and go as high as you want! If you’re eating downtown, expect a Western breakfast or lunch to cost between 150-200 THB. Many of the malls have huge (and popular) food courts where you can get a filling meal starting at 40 THB. Like the rest of Thailand, if you eat at the street markets like the locals, you’ll be hard-pressed to spend more than 200 THB a day on food (and maybe not even close to that). For specific restaurant suggestions and more details on the local market, see the in-depth guide at the end of this article. When it comes to drinking, going to bars can become pricey with the cheapest beers costing about 60 THB each and cocktails sometimes cost double or triple that. Whereas actually buying beers from 7-Eleven to drink on the street can be 30 THB per can. Transportation costs – Although city buses can be very crowded, they are convenient and inexpensive. For 10 THB on the non-air conditioned buses and 15 THB on the air-conditioned buses, you can travel pretty much anywhere in the city. The SkyTrain and Metro cost 15-50 THB per trip. You can get a day pass for 120 THB. Taxis throughout the city cost around 70-100 THB, and one from the airport to Khao San Road will set you back 300-500 THB. Alternatively, there’s a Suvarnabhumi Airport Rail Link Express that’s a 15-minute non-stop journey between the city and the airport, costing only 150 THB per trip. Note: Transportation is Thailand is relatively easy to navigate as a non-Thai speaker, so just be sure you have a map with you and the name of where you’re going written down and you’ll be able to find your way with the help of some locals. Eat from the street stalls – Food from street vendors in Thailand is some of the best Thai food I have ever had and so cheap it is ridiculous. You can easily have a bowl of noodle soup, pad thai, or fried rice for 30 THB. The locals eat here, you should eat here. Not only is it the best food around, it’s the cheapest! Make sure your taxi turns on the meter – All taxis are required to use a meter when they have passengers with them. However, most will want to charge a higher ‘flat rate’ (instead of using the meter), especially if there’s traffic. If this happens, just walk away and see if a different taxi will turn on their meter for you. Negotiate with tuk-tuk drivers – Unlike taxis, the tuk-tuk drivers do not have meters, so be sure and set the fixed price before you take off. They are very friendly, but if you are going to play the naive tourist, you will get taken advantage of! Use public transportation – Locals use the extensive bus and BTS systems to get wherever they need to go in Bangkok. To save money, you can do the same. A 20-minute taxi ride might cost you 120 THB, while the same ride in a bus might only cost 10 THB. Bonus: if you take the metro instead of a taxi, you’ll be able to avoid the headache of inner city traffic. Avoid drinking on Khao San Road – While fun, a night out in the backpacker area of Khao San Road will leave your wallet empty. And, speaking of drinking, stick to beer. Cocktails and wine are mostly imported with high taxes so cost a lot more than the local beer. Take the boats – There’s a limited canal system in Bangkok that can get you around parts of the city quicker (especially from Khao San Road to Siam Square) and cheaper than taxis or the SkyTrain. Prices are between 5-15 THB depends on the distance. Couchsurf – Nothing’s cheaper than sleeping for free. Couchsurfing connects you with locals who will give you not only a free place to stay, but also a local tour guide who can introduce you to all the great places to see. Stay in hostels – Bangkok has so many hostels throughout the city, including lots that have popped up recently to meet the demand of backpackers. 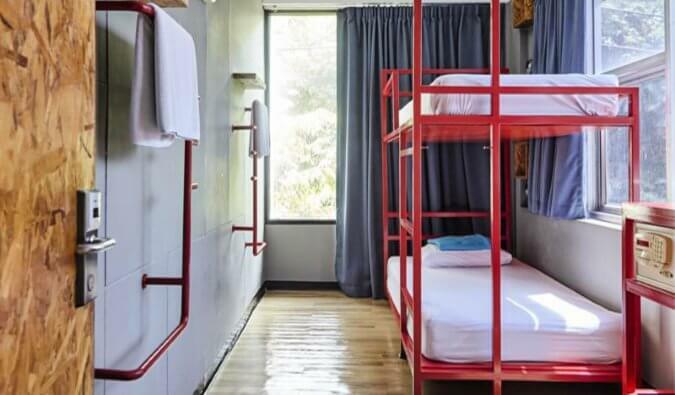 You’ll be able to find fun, clean, well-designed, cheap hostels in every corner of the city. So even if you’ve never considered staying in a hostel before, consider starting here. The competition is high, so the quality of hostels has been pushed to rise. Bargain hard – When shopping at the markets, whip out your negotiation skills. The rule of thumb is the more you buy, the cheaper the prices will be. So shop in packs for the best deals. 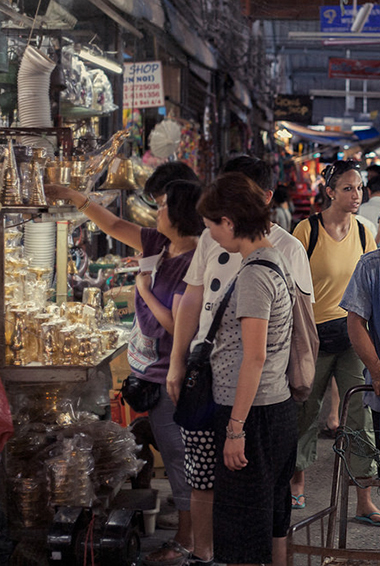 GO DEEPER: Nomadic Matt’s In-Depth Budget Guide to Bangkok! 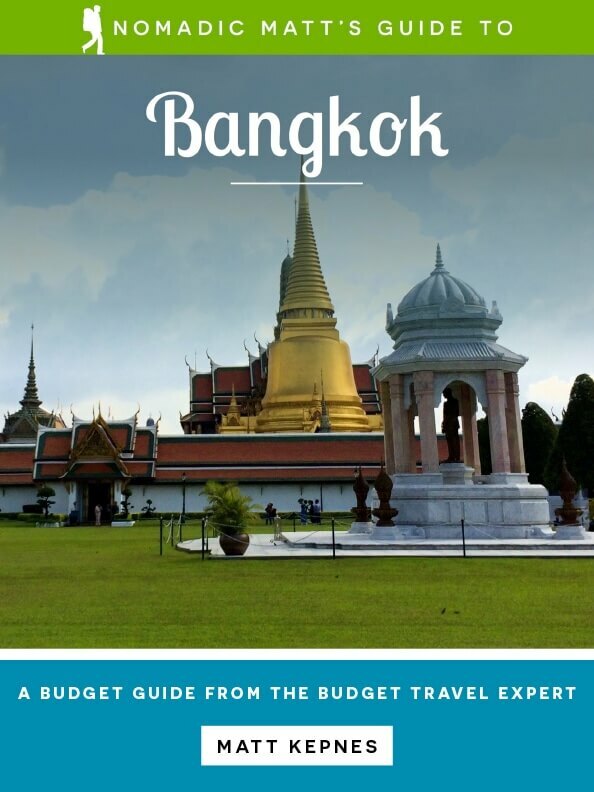 For more in-depth information and tips, check out my detail digital guide to Bangkok (a city I used to call home). 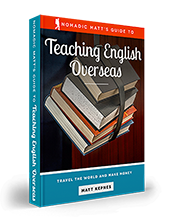 This guide is written for budget travelers like yourself – people who want to be more than tourists – and cuts out the fluff found in other guides while getting straight to the practical information you need to travel and save money. 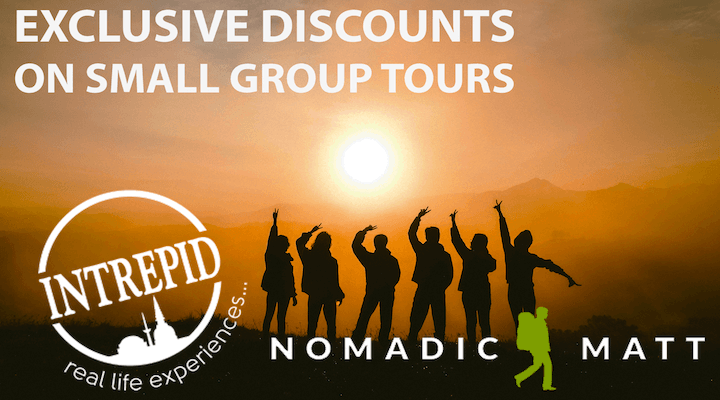 In this book, you’ll get all the above information plus detailed suggested itineraries and budgets, more ways to save money, more on and off the beaten path things to see and do, and all my favorite non-touristy restaurants, markets, hostels, bars, and more!! You’ll be able to save it to your phone, Kindle, or iPad and have it with you whenever you are. Just click here to learn more and get started.